Coexistence mechanism of 4 sympatric species of Paradoxurinae, Viverridae in Borneo. Aiming at elucidating the coexistence mechanism of four sympatric frugivorous civets, namely Common palm civets (hereafter CP), Small-toothed palm civets (hereafter ST), Masked palm civets, and Binturongs, I stayed at Danum Valley Field Centre, Sabah, Malaysia for 113 days. 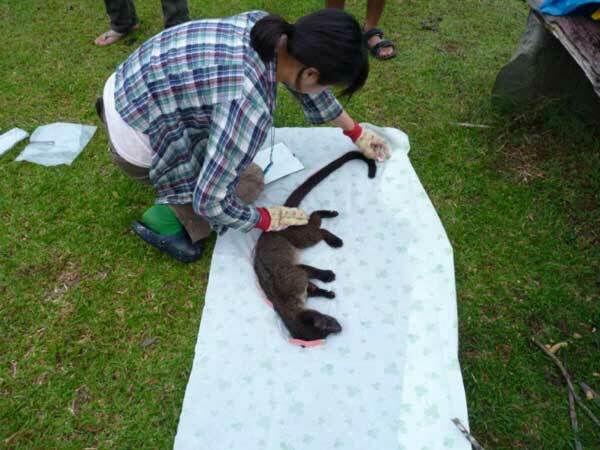 In total, I and research assistants captured 4 palm civets (three CPs and one ST (Fig. 1)). We attached the radio-collar to all of them and succeeded to track them after we released them. The collared Small-toothed palm civet had a larger moving area than the other three Common palm civets. This difference could result from their foraging patterns. The collared ST might search for large fruiting fig trees because he usually stayed in relatively large fruiting fig trees in tracking for him. On the other hand, CP often foraged around the human settlements after the trees finished their fruits within their moving range. We'll continue to study in order to obtain more interesting results.